This student won $20, not because he wanted $20, but because he got out of his comfort zone to get the $20. 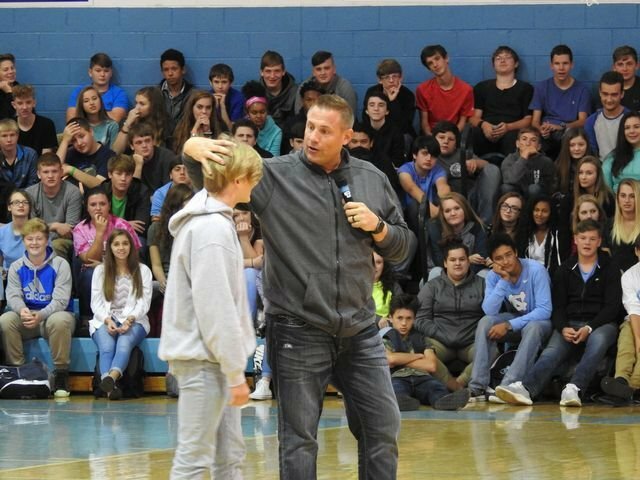 Inspirational speaker, Chad Varga spoke this morning to the students of Central High School. Varga grew up with a drug-addicted mother who was constantly abused by a string of bad boyfriends. As he grew older, he would try to defend his mother, which would result in him being assaulted by the boyfriends. His moment came when a teacher sat down with him and asked him about his home life. Varga replied, "Nothing." Refusing to take that answer, the teacher presistant until Varga poured out his heart. The teacher contacted local authorities, and Varga was removed from that toxic environment. Varga went on to become a high school basketball All-American, starring in the Big East Conference at the University of Pittsburgh, and then played professional basketball. At age 25 at the peak of his career, he changed course and dedicated his life to inspring young people. Varga asked the Central Students if they wanted to succeed, and they all raised their hands. He then pulled out a $20 bill and asked if they wanted to it. Everyone raised their hand, but one student actually raced out onto the gym floor. He received the $20 boy. Varga pointed out that in life, it's not enough to raise your hand and say that you want to suceed. You got get off the bleachers and go for it. He also told the students to be selfish about whom they spent time with. The people you hang around with, Varga noted, determines how far you go in life. He also a special message to all the boys - treat the girls with respect. Don't pull up and honk the horn or send a text. Go to the door and knock. Open the car door. Pull up the chair. Buy here flowers. And he don't told the ladies not to settle for anything less than the best.